The Bergen Philharmonic orchestra event in Paris which took place at the end of March resulted in good response from the targeted Mice agencies which had been invited. This event reflects on how France intends to work in the future with the B2B and MICE markets by combining smaller and targeted events to a bigger and general tourism fair. The 31st of March Bergen Philharmonic Orchestra played at "La Seine Musicale" in Paris. 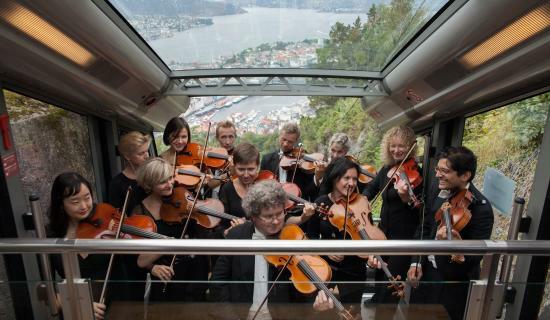 Innovation Norway Paris in partnership with Visit Bergen, the Bergen Philharmonic Orchestra and Air France decided that this was the perfect occasion to shine a light on Bergen as a year-round culture-and-Meetings destination. Agencies from the MICE and culture travel segment were invited to the concert and a following coktail. The program featured Edvard Grieg and Brahms conducted by Ed Gardner. Griegs A-minor piano concerto performed by Alice Sara Ott was a high point. At the cocktail Bernt Bauge from from "Harmonien" presented the orchestra and its history and Britt Angell Hansen from Visit Bergen got the opportunity to highlight the direct flight Paris Bergen with Air France KLM and why Bergen is the perfect place to organise meetings and events. 34 people from 12 agencies accepted our invitation. At the end of the cocktail we drew a winner for a week-end in Bergen with hotel and activities included. The winner, Manuel Galvao from Maman l&apos;Agence, said they look for alternative cities and Bergen has something unique to offer that cannot be found anywhere else in the world. He pointed out that the direct flight route between Paris and Bergen brings these experiences closer. During the cocktail, several agencies also underlined their need for alternatives to "beach and sun" destinations as their clients are more and more demanding for other experiences. The focus on Bergen as a food, culture and nature destination found therefore an interest among the atendees which are now individually followed up by Innovation Norway Paris. Innovation Norway Paris will not organize Workshop Nordique this year but will prioritize smaller events that are particularly targeted toward a specific theme or a segment. It has been noticed that the French B2B market responded quite well to this form of event and the results are promising. In December we successfully arranged a mini-workshop in Chambery in connection with the Mountains on stage film festival where providers from Fjord Norway and specialists from the outdoor segment in France talked about opportunities for ski touring in Norway. In February, we organized a breakfast meeting with 30 participants from tour operators, flight companies and Hurtigruten. The goal was to explain Visit Norway&apos;s new strategy and present our new team in Paris. In the wake of this meeting several training sessions were set with some tour operators for the upcoming spring and a risen interest for culture and sustainability were shown. We find that smaller events with or without partners are cost and time saving and enable to meet the right buyers in the right arena. Parallelly we see that it is also important to showcase Norway with a more general approach in order to have the opportunity to meet new buyers in the market. This is why we are attending France&apos;s biggest B2B fair - IFTM Top Resa in Paris from 1st to 4th October 2019. About 7000 tour operators and agents and 300 MICE buyers from all of France attend the fair to meet French and international exhibitors from the travel industry. Conferences and networking events are held during the whole fair. This year, Innovation Norway Paris are planning to organize an event focusing on sustainability. Léa is Market Specialist, Visit Norway, for Innovation Norway France.